HEPA filter is an additional sale item. 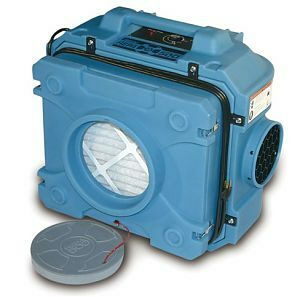 DRI-EAZ HEPA500 is a three-stage air filtration unit. When the machine has 2 pre-filters and the HEPA filter installed it achieves an efficiency rating of 99.97% against oily aerosol particles down to 0.3 microns. Husqvarna A 600 is a quiet operating air scrubber that comes in a sturdy cabinet. This machine can be run at 300 or 600CFM and requires the purchase of a pre-filter and a HEPA filter that is tested and certified for an efficiency rate of 99.99% at 0.3 microns. * Please call us for any questions on our hepa air scrubber sm rentals in Santa Barbara CA.